MAIRS, JOSEPH, coalminer and unionist; b. 4 Feb. 1892 in Airdrie, Scotland, son of Joseph Mairs; d. unmarried 20 Jan. 1914 at Oakalla Prison Farm near Burnaby, B.C. Joseph Mairs, who most likely emigrated with his parents between 1908 and 1912, worked as a miner in the Extension colliery at Ladysmith, on Vancouver Island. 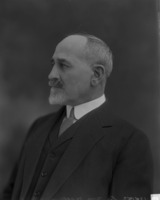 There he took part in the bitter strike that began in mid September 1912 at the Extension and Union mines against Canadian Collieries (Dunsmuir) Limited, of which Sir William Mackenzie* was president. The strike started when two activists, members of the United Mine Workers of America, were fired. The miners responded by declaring a one-day “holiday” and demanding that Canadian Collieries recognize the union. Instead, it locked out the workers. The strike would not be ended by the miners until 19 Aug. 1914, following the outbreak of World War I and two months after the UMWA had withdrawn its financial support. By May 1913 the strike had spread to the other mines on the island. When Canadian Collieries evicted miners and their families from company homes and imported strikebreakers, union miners organized strong picket lines. The province sent in constables, and by August scuffles were breaking out. On 13 August, two days after a major riot at Nanaimo, miners in Ladysmith, alarmed by rumours of armed police, protested in the streets and at the pits, smashing windows, setting fires, and attacking the strikebreakers. The government called in the militia; more than 200 strikers from Ladysmith and elsewhere were charged with rioting and related offences, and were held without bail. One of those arrested was 21-year-old Joseph Mairs. He chose a speedy trial by judge and pleaded guilty in the hope of receiving a short sentence. However, on 23 October provincial judge Frederic William Howay sentenced him to 16 months. Mairs was taken to Oakalla Prison Farm, where he was put to work clearing land. Described by the warden as a “good, quiet prisoner,” he was transferred to the prison’s kitchen on 12 Jan. 1914. Two days later Mairs complained of severe stomach cramps. He was given hot-mustard pills, cod-liver oil, and salts by an inmate who served as a medical attendant, but his condition worsened. On the 18th the prison’s doctor diagnosed acute indigestion, despite having been told that Mairs had had surgery in Glasgow in 1907 or 1908 for a bowel obstruction. He prescribed a “stomach medicine” and the following day administered an enema. On the 20th Mairs died. An autopsy revealed that he had tuberculosis of the intestine. Obstructed by adhesions and undoubtedly weakened by the mistreatment, his bowels had ruptured, and Mairs died of peritonitis. Ironically he had pleaded guilty in order to avoid a long sentence, which he feared he would not survive. His father, who had also been arrested, pleaded not guilty and was acquitted by a jury. Joseph Mairs’s brief life and tragic death are indicative of the fierce opposition British Columbia’s workers faced in their efforts to unionize in the years before World War I. For the miners, who had little protection under laws that favoured the business interests of the day, life could be brutish and short. BCARS, GR 1327, no.52/14 (mfm.). Ladysmith cemetery (Ladysmith, B.C. ), Tombstone inscription. British Columbia Federationist (Vancouver), 23 Jan. 1914. Daily News-Advertiser (Vancouver), 21 Jan. 1914. Ladysmith Chronicle, 27 Jan. 1914. Vancouver Daily Province, 21 Jan. 1914. Vancouver Daily Sun, 21 Jan. 1914. Lynne Bowen, Boss whistle: the coal miners of Vancouver Island remember (Lantzville, B.C., 1982). B.C., Legislative Assembly, Sessional papers, 1912, no.K: 231. Canadian annual rev. (Hopkins), 1913: 681–82. Labour Gazette (Ottawa), 13 (1912–13): 400; 15 (1914–15): 379–81. P. A. Phillips, No power greater: a century of labour in British Columbia (Vancouver, 1967). A. J. Wargo, “The great coal strike: the Vancouver Island coal miners’ strike, 1912–1914” (ba thesis, Univ. of B.C., Vancouver, 1962). Mark Leier, “MAIRS, JOSEPH,” in Dictionary of Canadian Biography, vol. 14, University of Toronto/Université Laval, 2003–, accessed April 26, 2019, http://www.biographi.ca/en/bio/mairs_joseph_14E.html.